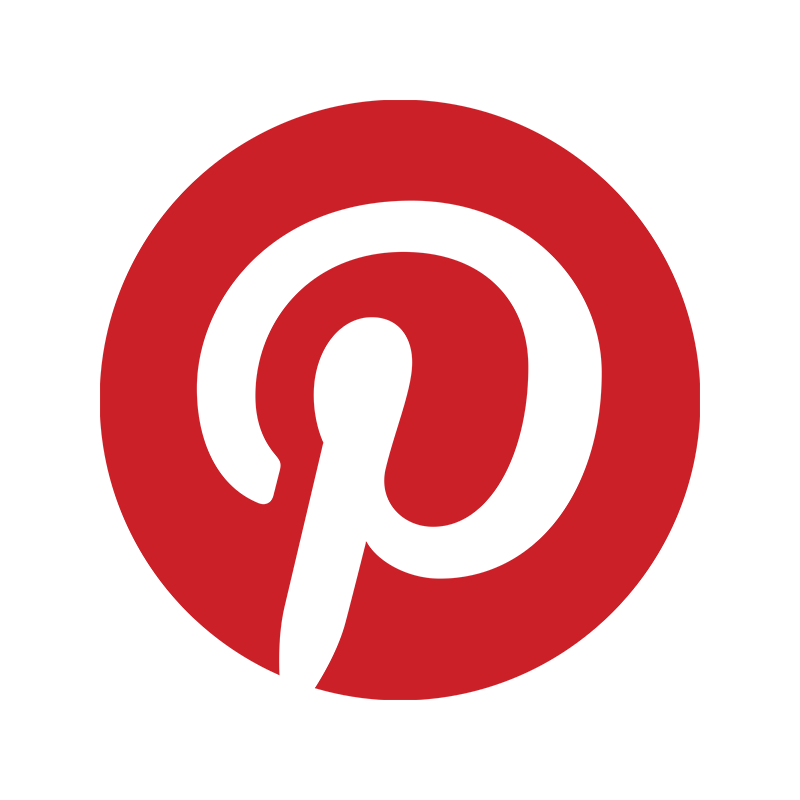 ← Inspiration & FREE SHIPPING? Would you like to give a WireKnitZ® Workshop to someone or perhaps to yourself? We hope you will join us in Tucson, February 4 – 9, 2014 at the Windmill Inn, our NEW venue, where we will introduce new designs, complete kits and offer workshops. Page down to see a snapshot of our workshops below, but for complete details please visit our website. 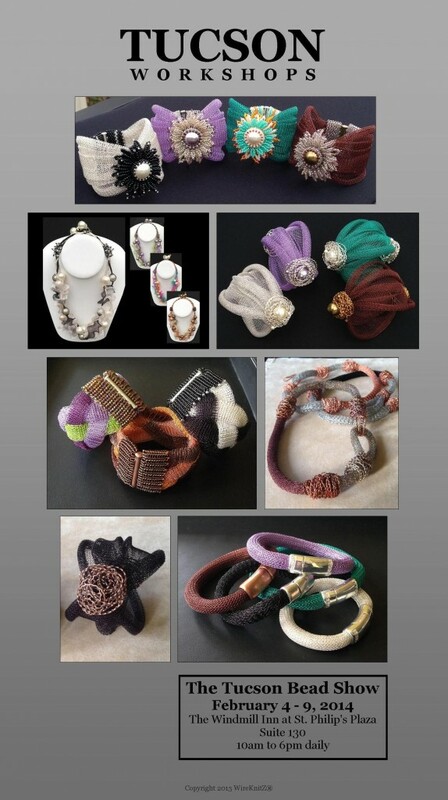 To register for workshops, please contact Norma Melton at norma@wireknitz.com or call 248.544.1911. If you can’t make it to Tucson, then we hope you will join us, February 19 – 22 at the Great Lakes Beadworkers Guild . You do not need to be a member to attend the classes. However, by taking only one class, you will have paid for your annual membership! Skill Level: Basic beading skills and familiarity with tubular peyote stitch. Asters get their name from the Latin word for “star” and their flowers are indeed the superstars of the fall garden. Sheryl Lamarand shares how to manipulate and fold WireKnitZ® to create the foundation and showcase the Aster flower inspired by Wendy Zollar’s “Flower Button Closure for Netted Scarf” design. Use tubular peyote and fringe techniques to make the components for this custom fitted, comfortable and easily worn cuff. See all the details for this workshop HERE. 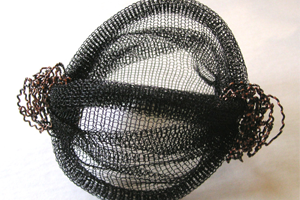 The organically manipulated corrugated wire embellishments create the Orbital Cuffs. 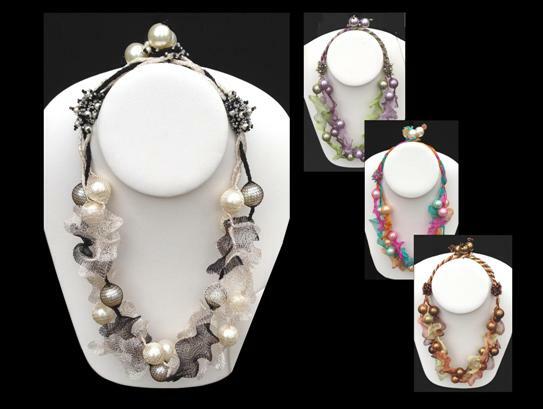 Create yours with or without Pearls for an attractive yet edgy industrial chic. Students will learn how to achieve various finishes on the corrugated wire as well as manipulation techniques unique to designing with WireKnitZ®. To register for this workshop, please contact Norma Melton at norma@wireknitz.com or call 248.544.1911. Urban Funk Necklace Skill Level: Dexterity is necessary & wire wrapping experience is helpful. Date: Wednesday, February 5, 2014 Time: 2:00 – 5:30The organically manipulated corrugated wire embellishments create this edgy industrial chic Urban Funk Necklace. Students will learn how to achieve various finishes on the corrugated wire as well as manipulation techniques unique to designing with WireKnitZ®. See all the details HERE for this class. To register for this workshop, please contact Norma Melton at norma@wireknitz.com or call 248.544.1911. Barb’s 4-Braid Cuff Skill Level: Basic beading skills and familiarity with Herringbone/Ndbele stitch. 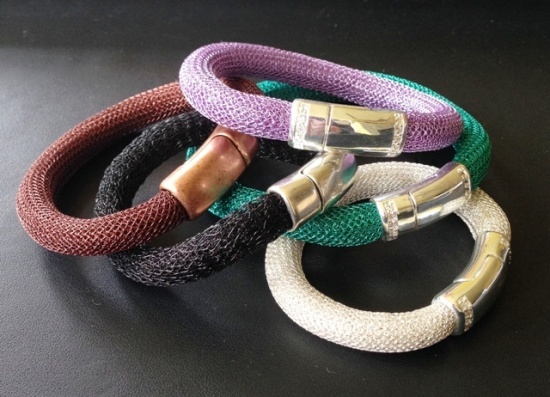 Date: Friday, February 7, 2014 Time: 10:00 – 2:00Make a dramatic statement with Barb’s 4-Braid Cuff. 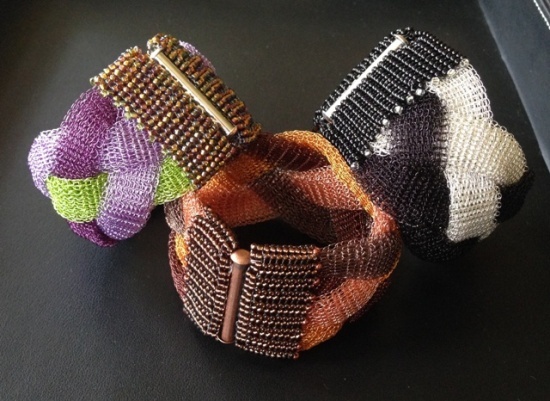 Sheryl Lamarand will show how artist/designer Barb Klann adapted directions for a four strand WireKnitZ® braid incorporating beaded herringbone end caps to accommodate the bulkiness of the wire mesh with a comfortable tube clasp closure. See all the details HERE for this class. To register for this workshop, please contact Norma Melton at norma@wireknitz.com or call 248.544.1911. Solar Flare Necklace Skill Level: Basic beading skills Date: Saturday, February 8, 2014 Time: 1:00 – 5:00Fun & flirty or classic & elegant! 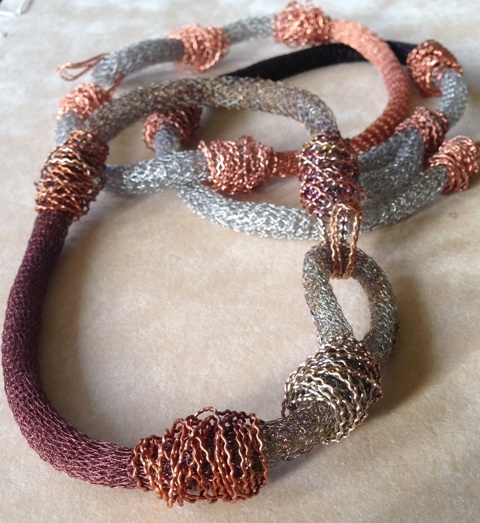 Create the Solar Flare Necklace by stretching, twisting and manipulating the copper wire tubular knit mesh. You will learn various techniques to set and keep your design in place as well as storage and travel suggestions to keep your unique artwear safe. See all the details HERE for this class. To register for this workshop, please contact Norma Melton at norma@wireknitz.com or call 248.544.1911. Convertibles Bracelet Skill Level: All Dates: Tuesday, February 4, 2014 & Friday, February 6, 2014 Time: 5:00 – 6:00 Please arrive 15 minutes early to select your materials.The Convertibles Bracelet is an easy introduction to WireKnitZ®. With only two components to make this bracelet, you will select the WireKnitZ® color and magnetic clasp of your choice, which is a snap to attach and is available in antique metal finishes or shiny with crystal bling. Make one for a terrific bracelet, two for a chunky choker, three for a longer necklace or several for a belt– it’s all up to you! See all the details HERE for this class. To register for this workshop, please contact Norma Melton at norma@wireknitz.com or call 248.544.1911. The Windmill Inn at St. Philip’s Plaza is a Tucson landmark with tile art, fountains, rose gardens, and eucalyptus trees. It is located next to St. Philip’s Church, an architectural masterpiece –with twelve-foot arched windows that open to the desert and Santa Catalina Mountains. 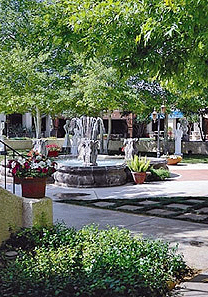 In the adjacent St. Philip’s Plaza, Spanish mission-style buildings and gardens offer galleries, boutiques, restaurants, farmer’s markets, weddings, and jazz concerts. This elegant setting provides attendees with parking and frequent shuttle service. The Windmill Inn, 4250 North Campbell Avenue, Tucson, AZ. Click HERE for more information about the Tucson Bead Show! Whether in Tucson, Metro Detroit or wherever our adventures take us, we look forward to seeing old friends and making many new! Until then, we wish you crates of creativity and a windfall of WireKnitZ®!